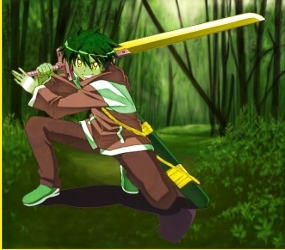 Description: A Man with green hair and light green skin, He has yellow eyes that glow like the sun. He perpetually looks like a teen. Personality: Silva is a kind person tho he can become detached from people do to his not needing to eat, sleep, or breath. He enjoys solitude and has a room that grants full sunlight where he can read and enjoy the solitude. He is a team player and will do anything to protect his friends. He loves exploring new words. Silva is also an accomplished swordsman carrying a large Lacrima blade. History: Silva was raised by a dragon named Draconem Plantatio Solarium the dragon of plants. The dragon trained Silva as a dragon slayer. He enjoyed those years however when he was 16 the dragon vanished leaving him alone. Alone he began looking for his parent however he soon become angry at the world and fell in with a Dark guild and the guild was impressed by his powers. however in an attempt to increase his powers, the dark guild implanted him with an experimental Dragon slayer Lacrima. However it had a weird effect. instead of increasing his abilities it changed him, his skin turned green and he has not aged a day since then. It was found upon examination his body had completely absorbed the Lacrima leaving no trace. Unexpectedly he did not gain the wanted dragon force ability, however it was found he no longer had a reason to eat, breath or sleep. He soon detached from humanity and became a feared assassin. He took on several high profile jobs, until one day a job brought him into conflict with the number one guild fairy tail and he was completely overwhelmed. Seeing the teamwork and dedication of the guild changed him, he wanted to be a part of something like that. Looking to redeem himself he decided travel the world and help people. His travels showed he did care for people and enjoyed helping them. Eventually he came across a town being attacked by a dark guild. Despite the odds he decided to take on the group on his own. Tho over matched he was given a solar Lacrima blade the very relic the Dark guild wanted from the town. With new blade in hand he managed to defeat them. However the last member as he fell cast a dark banishment spell on him. Suddenly engulfed in darkness Silva awoke to find himself in a strange place. He was quickly apprehended by strange people and interrogated about his origins and world. He soon learned he had been banished to a nexus world where multiple worlds converged. He at first joined the exploration team hoping to find his world. However he has discovered a love for exploring new worlds and helping people. Leaf healing- can cocoon allies in healing leaves to speed up healing. Immunity to ageing, sleeping, and plant based poisons- as a plant he has stunted aging, as well as no need to sleep, and his body can easily process poisonous, and toxic plants. Motion Sickness- Completely incapacitated while on a moving vehicle, except for living friends. Lacrima Solar greatsword Dmg 10-/typ Phy Special property energy battery- can spend a round to store 10 sp per round. Can release sp in a solar slice that does damage based on stored energy (Damage is amount of stored Sp type is Special) or to regain that much hp and sp. the energy can not be regulated and all stored sp is expended when used. Passive Ability 2- Immunity to poisons- does not take damage from poison effects. Limit breaker- Dragon Force- twenty percent increase to hp and sp and ten percent increase to all attacks and defense. lasts five turns.